Click Here To See Published Poster This Art Was Used For! 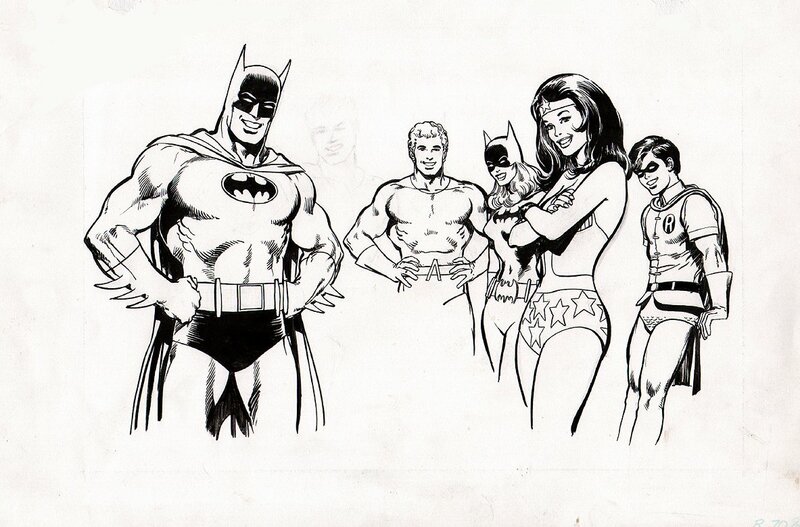 Check out this INCREDIBLY detailed 1970's pinup which was penciled and inked by the great NEAL ADAMS! This nice pinup was published for a 1977 DC Vitamins ad poster featuring a LARGE knees up body shot of Batman, as well as a nice large image of Wonder Woman, with nice detailed images behind Wonder Woman featuring Batgirl, Aquaman, and Robin! There is a lightly penciled head and shoulders image of Superman that was started and stopped in between BATMAN and Aquaman. This nice image is drawn on a 10.9 by 15.75 inch piece of art board! This 1970's Neal Adams beauty was also published in the Volume 2 edition of the "Art Of Neal Adams" published by Sal Quartuccio in 1977. There are 2 tape tag areas in the upper left and upper right of art board, as this piece was previously in a mat which has been removed, and again, this is well above any of the drawn image area and doesn't interfere whatsoever with any drawn artwork! Just a great opportunity here to own a VERY NICE 1970's Neal Adams Batman pinup without having to pay Neal Adams Batman cover prices! Click on the red link above to compare this GREAT art piece to the PUBLISHED poster ad this art was originally drawn for! SWEET! ALL HIGH end pieces of art, including this one, are able to be purchased with VERY fair time payment plan options, and trades are always considered towards this and any other pieces of art on my site here! Just send me an email and we can try to work something out.